The conspiracy of silence is crumbling and lifting the shrouds of secrecy that have surrounded the drone wars of the past decade. The carefully maintained secrecy firewall is now under virulent attack from all sides. For starters, a plethora of lawsuits have been filed across the world, including the UK, Pakistan and the US calling for public accountability and full disclosure, especially regarding civilian casualties. In August this year, the UN Special Rapporteur on Human Rights and Counter Terrorism, Ben Emmerson boldly called for an independent investigation into the US drone campaign and, when required, for the UN to step in to address the alleged human rights violations. On another front, the viral YouTube video showing American journalist and anti-drone activist Medea Benjamin daringly interrupting the speech by a senior US Homeland Security official epitomises the commitment of the rising global consciousness on this issue. Moreover, a team of committed global activists and organisations fighting for justice, human rights and the truth has now taken up the case against this brutal war. In this regards, the Stanford/NYU law schools last week jointly released by far the most comprehensive investigative report on the drones campaign. As a Pakistani, it makes for a shocking read and brings out some chilling facts. Firstly, that this drone war is highly ineffective, with only 2 percent of its victims being the so-called “high value” terrorists that it aims to target. 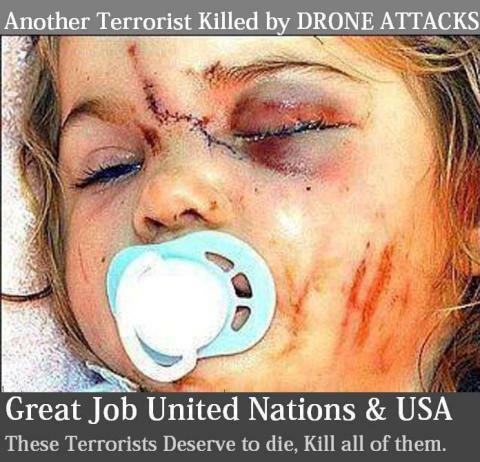 Secondly, the collateral damage is extremely high – thousands of innocent civilians, including women and children, have been mercilessly butchered by the unmanned drones. Thirdly, these hovering killing machines have managed to terrorise and traumatise the whole region and, consequently, over a million people have been forcefully displaced to escape the drone-hit areas. Fourthly they are, in fact, counterproductive in fighting terrorism with evidence now suggesting that the drone killing fields are breeding extremist behaviour driven by revenge and becoming a prime recruiting tool for non-state militants. Fourthly, that this war is openly and illegally flouting international laws and creating dangerous precedents that could come home to roost as more countries develop lethal drone technologies and devise their own rogue killing programmes. Interestingly, these deductions make perfect common sense; the report merely validates them with concrete research. Yet the theatre of this unjust war is continuously expanding and now, reportedly, includes six countries: Afghanistan, Iraq, Libya, Yemen, Somali and Pakistan. Quite disturbingly, Pakistan lies at the epicentre of this remote control war and has been subjected to the largest and most active target-killing programme, having suffered more than 337 strikes since 2004 with 80 percent of these occurring in the last three and a half years. This “weapon of choice” is now responsible for the death of 3000 innocent people in Pakistan – 176 of them children. Can this unjust war ever breed peace? Ironically the country whose citizens are being subjected to this extra-judicial target killing is also called an ‘ally’ – and ally that has already sacrificed 34000 citizens, 4000 soldiers and drained its economy to the tune of $68 billion. 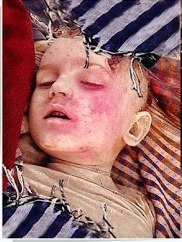 In Pakistan, the drone strikes’ target zone is Fata, with a particular focus on North and South Waziristan. All students of history can vouch for the hard resilience, blind loyalty and honour codes of the fiercely independent tribes that inhabit this area. However, the arrogance of power has once again refused to learn from history. In response to similar problems in a different era, the British were forced to devise a strategy of tribal management based on a policy of containment rather than control and weighed in by a balanced combination of incentives and force. This time around the drone war is contemptuously challenging this age-old premise by forcing humiliation onto a proud people and unsettling a whole region to weed out a few suspected militants. Not surprisingly, evidence now clearly suggests that this strategy is not working. 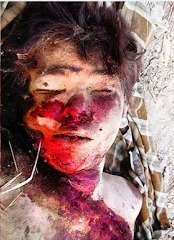 Instead of winning the hearts and minds of the local people, the drone campaign is forcing them towards militancy. Instead of isolating the terrorists, it is terrorising peaceful civilians into joining their ranks to seek revenge from a state they feel has abandoned them and from a superpower they feel has done them inhumane injustice. This cold doctrine of preemptive target killing with the man behind the drones acting as judge, jury and executioner all in one, clearly violates all international laws and is also a direct infringement of Pakistan’s sovereignty. Subsequently, the parliament of Pakistan has spoken with unanimity but, unfortunately, with a helpless timidity on the issue. The government, on the other hand, seems to have yielded to the trigger-happy cowboys who sit thousands of miles away and push the kill button. The WikiLeaks disclosure quoting former Prime Minister Gillani in 2008, “we’ll protest in the National Assembly and then ignore it”, really sums up the hypocritical protests that are made without lodging formal complaints or seeking international remedies. In this state of despondency, helplessness and silent surrender, it is commendable that one political party, the Pakistan Tehreek-e-Insaf (PTI), has decided to break the ranks and make an effort when no other political party is willing to pay more than the usual lip service. It is time to own up to this travesty of justice within our own country before the war-torn region gets irreparably engulfed with the air of revenge. The foreign funded insurgency in our tribal areas can and will one day be eradicated but the trust and loyalty of our tribal brothers, if left to suffer alone in this hour of need, may be lost forever. The rest of the world, and Pakistan, need to see the tragedy of the drones before we erroneously give up on Waziristan as an exclusive haven for extremism. With global activism and advocacy rising, the moment is right and the peace march will strive to seize this moment to show our collective resentment and take the first bold step to arrest this horror from the sky. This entry was posted in Behaviour, News & Views, Politics. Bookmark the permalink. Reblogged this on Human Rights & Politics.